Account-based marketing (ABM) is a newer term for a timeless strategy – targeted account selling. With an ABM approach, marketing and sales teams work together to identify high-potential accounts and target them with customized tactics designed to convert them into customers. ABM isn’t a one-size-fits-all approach. 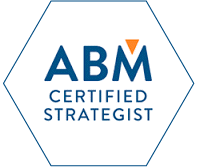 Our ABM consultants work with you to define the right strategy for your company, then help you execute your program and measure your results.